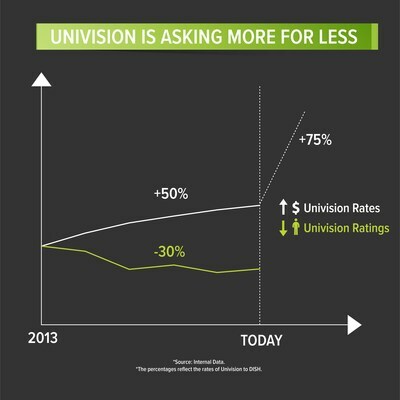 ENGLEWOOD, Colo., June 30, 2018 /PRNewswire/ -- In an effort to drastically raise rates amid declining viewership, today Univision Communications Inc. blocked DishLATINO and DISH customers from accessing three of its channels: Univision and UniMás (including local affiliates), and Galavisión. Univision has also blocked Sling customers from accessing all of its channels on the service. "Univision's attempted price hikes target Hispanics despite the fact that fewer members of our community are watching Univision," said Alfredo Rodríguez Diaz-Marta, Vice President of DishLATINO and Sling Latino. "We have served the Hispanic community for nearly 20 years, and as the leading provider of TV packages in English and Spanish, we owe it to our customers to deliver the best content at the best value," said Rodríguez Diaz-Marta. "For example, in the spirit of our 'sigamos haciéndola' campaign, we will soon be the first to launch a new, commercial-free channel wholly dedicated to teaching English as a second language to learners of all levels. This channel will be available to DishLATINO and Sling Latino customers at no additional cost." In many markets, Univision is available for free, over the air, with an antenna. To help ensure customers don't lose access to Univision shows as discussions continue, DISH, DishLATINO and Sling TV are making antennas available for free to customers in eligible areas. DISH and DishLATINO customers seeking more information can visit dishpromise.com or dishlatino.com/promesa. Sling customers can visit help.sling.com or ayuda.sling.com. "Given current events impacting the Hispanic community, we call on Univision to return its signal to DISH, DishLATINO and Sling TV customers as soon as possible. This is not the time to be making outrageous demands to make up for bad business decisions, or, as many have suggested, better position themselves for a sale," said Rodríguez Diaz-Marta.